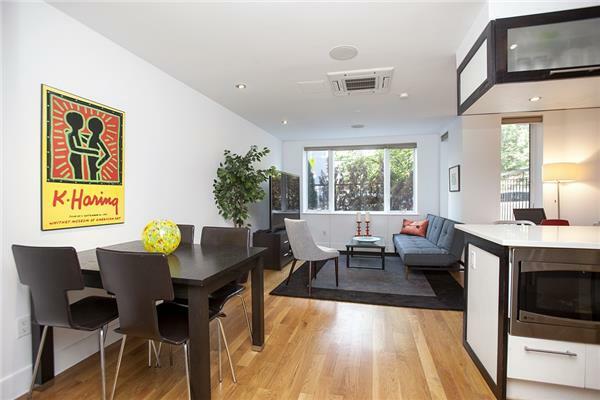 A special home at a great price, this beautifully upgraded, mint-condition 1028 SF duplex in sought-after Prospect Heights is both spacious and luxurious. Among the unique details are upgraded track and recessed lighting, custom closets and shelving, 1.5 tastefully designed tiled baths, a large soaking tub with shower and glass enclosure, a built-in sound system with iPod dock, a full chef+éGÇÖs kitchen with Bosch and GE Profile stainless steel appliances, a privacy-enhancing pocket door on the upstairs living level, a cozy yet spacious and customizable +éGÇ£bedroom area+éGÇ¥ on the lower level with windows to let in the daylight and fresh air, Mitsubishi split system zoned heating and cooling units, a new energy-efficient on-demand water heater and a washer/dryer hookup. Enjoy abundant storage space with 5 closets plus an additional deeded storage room that can accommodate bikes and other items. There+éGÇÖs also a private onsite gym. Built in 2008, 662 Bergen Street is a boutique residence offering privacy plus access to area attractions, just a 15-20 minute subway ride to Manhattan. This quiet haven conveniently located in leafy Prospect Heights (voted a Top 10 neighborhood in NYC by New York Magazine) is steps from the vibrant restaurant scene on Vanderbilt Avenue, and is close to the 2,3,C,B, and Q trains, PS 9, Grand Army Plaza, Prospect Park and the new Barclay's Center. The building has a 25-year tax abatement through 2032, keeping your monthly payments extremely low. For an appointment, please contact Aran Scott at (646) 479-8408 or ascott@space-ms.com. *Please note that in the original offering plan, #1A is not listed as a legal 1 bedroom.